On 15 of October, 2007, three hundred police officers dressed in full riot gear, including balaclavas and sunglasses, raided the township of Ruatoki which lies at the northern end of the Ureweras. At the same time as Ruatoki was being locked-down, police raids were taking place in other parts of the country. By the end of the day, 17 people were reported as arrested; four from Wellington, six in Auckland, one in Palmerston North, one in Hamilton and five in the Bay of Plenty area. 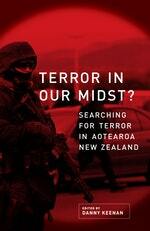 The 'global war on terror', launched in the US five years earlier, had finally arrived in New Zealand. Love Terror In Our Midst?? Subscribe to Read More to find out about similar books.